The Clubhouse :: Coombe Hill Golf Club welcomes visitors from all over the world to enjoy in the delight of meeting the challenges of one of Englandâ��s most highly rated and traditional courses. 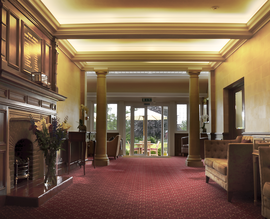 At the heart of Coombe Hill is a spacious clubhouse. The welcoming atmosphere is nowhere more evident than in the lounge bar, restaurant, and terrace, all of which overlook the 18th hole. Facilities within the clubhouse include, Lounge Bar, Restaurant, Bridge Room, Snooker Room, Ladies and Gentlemen’s Locker Rooms. In the summer, the terrace is a wonderful spot to relax.